(CNN) -- Europe experienced its worst quarterly drop in GDP in the first three months of the year, shedding 2.5 percent as German exports tumbled and investment plummeted across the 27-country bloc. The euro zone has suffered its worst recorded drop in quarterly GDP. 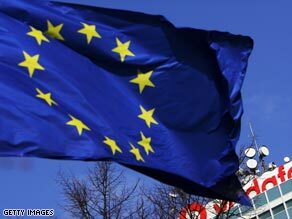 European Union statistics released Friday showed German GDP fell more than any quarter since the country's 1990 reunification, falling 3.8 percent from the last quarter of 2008. French GDP also slipped by 1.2 percent compared to the previous quarter, while Italian GDP fell 2.4 percent, the country's heaviest decline since 1980. Economists had forecast an ugly but less dramatic fall of 2.0 percent in euro zone GDP, after a drop of 1.6 percent in the previous quarter. Europe's major sharemarkets all dipped on the news, the London FTSE 100, CAC 40 in Paris and Frankfurt's DAX 30 down around a percent. However, analysts said there was some bright news among the gloom. "Although we are nowhere near the peak in unemployment, we can safely assume that the first quarter was the worst in terms of the pace of decline," Martin van Vliet, an economist at ING bank, told Reuters.com. Alexander Koch, an economist at UniCredit bank, added: "The latest ugly GDP figures should, however, mark the trough of the current 'Great Recession.'" Europe's plight is mimicked the world over, with the International Monetary Fund predicting the global economy will contract by 1.3 percent in 2009. It has predicted a modest recovery in 2010, with growth of 1.9 percent.